Dunfermline have formally lodged an appeal against their expulsion from the Scottish Cup. The Scottish FA will assemble a three-man independent panel to rule on the issue within the next seven days. The SFA took the step to throw Dunfermline out as it said the Pars broke several competition rules in their 7-1 win over Stenhousemuir. The main contravention was fielding Calum Woods as a substitute despite the defender being suspended. Explaining the verdict, SFA chief executive Gordon Smith said: "It is unfortunate, but there was no alternative after the rules breaches." If the decision stands, it will deny First Division Dunfermline a lucrative potential fifth-round tie against Celtic. Second Divison Stenhousemuir, as it stands, have been reinstated into the competition and will face the winners of Celtic's tie away to Morton. "The integrity of the Active Nation Scottish Cup was paramount in the decision making process," said Smith of the decision reached unanimously by a six-man SFA emergency committee at Hampden Park on Thursday. In addition to fielding the ineligible Woods, whose ban carried over from last season's semi-final against Falkirk, Dunfermline were also found guilty of three other infractions. They were punished for administrative errors stemming from their failure to submit a team-sheet that included the mandatory two under-21 players. Dunfermline also neglected to specify the ages of the players on their team-sheet and, when this was pointed out to them prior to kick-off, they sought to replace one of their substitutes. However, any changes made to a team-sheet less than an hour before kick-off must result in that club's quota of substitutes being reduced and that was not done. The SFA added that Dunfermline admitted liability in failing to acknowledge Woods' suspension despite receiving 26 issues of their suspensions list over the weeks since the ban was announced. Dunfermline said in a statement: "DAFC would, first and foremost, sincerely apologise to all their fans for this situation. "DAFC do believe, however, that being expelled from The Active Nation Scottish Cup is excessive and do intend to appeal the SFA decision." 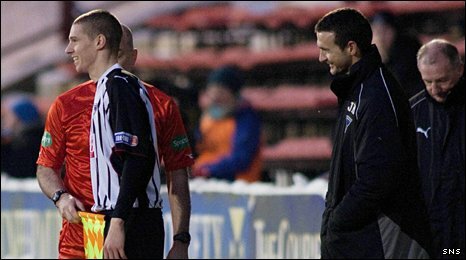 Dunfermline manager Jim McIntyre had previously apologised on the club website for what he described as "an honest mistake" and for "embarrassing the club". Vowing that the same "administrative error" would not be made again, McIntyre explained that the club had checked the wrong section of the SFA website ahead of the match. Dunfermline fan and MSP for Mid Scotland and Fife John Park insisted the tie should have been replayed, saying: "This appears to be a completely disproportionate sanction from the SFA. "I recognise there were a number of administrative errors made, but it's not as if the final result was close or the introduction Calum Woods had a material effect on the game - Dunfermline were 4-0 up at the time. "The people I feel most sorry for are the fans, who were looking forward to a possible cup tie against Celtic." Stenhousemuir manager John Coughlin felt sorry for his Dunfermline counterparts. "I thought they would be fined and that would be that and it seems to be a fairly harsh punishment for a minor crime. "It's a huge financial blow for a club like Dunfermline to miss out on a game against Celtic or Morton." Two years ago, Brechin City were expelled for fielding two ineligible players in their defeat of Hamilton Accies. At that time, the SFA initially ordered a replay and fined the club £10,000 when it was thought only one ineligible player had been fielded. However, the club were ejected once it emerged a second player had been used who should have been serving a ban. In 2006, St Mirren were fined £25,000 for breaching the under-21 rule in a cup win over Spartans.